The real question a psychologist is asking right now: Is the woman played by an actual female or not? 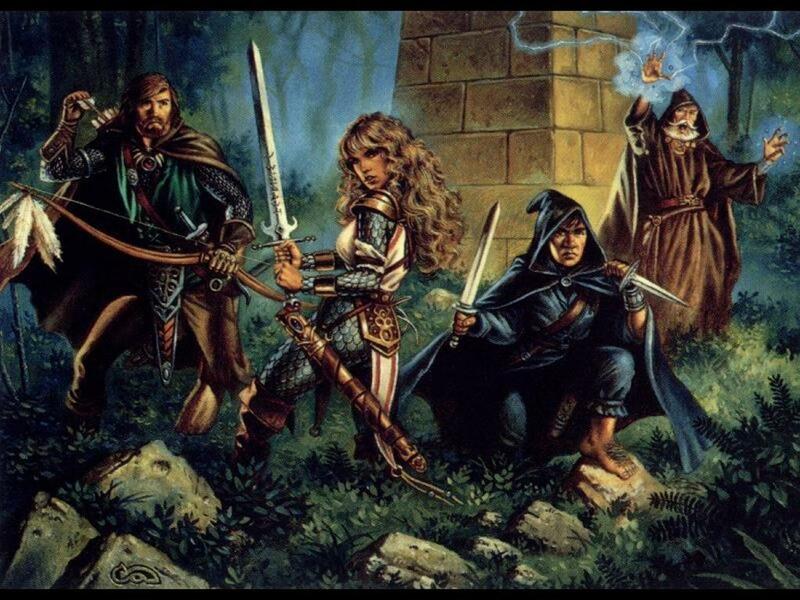 When you run or play in enough role-playing games, you start to wonder: how much does the character people select to play say about them as a person? I mean, there has to be some correlation, doesn’t there? You ask somebody to create an imaginary character they wish to portray and they come up with something – it has all the trappings of the kind of exercise a therapist might suggest. Affirmation of identity is what players endeavor to find through virtual play, and Bartle (2001) sees immersion, the level of involvement in a game, as an aid to convey this affirmation of identity. Bartle describes the highest level of immersion, termed ‘Persona’, in a very clear way: “A persona is a player, in a world. Any separate distinction of character has gone – the player is the character. You’re not role-playing a being, you are that being; you’re not assuming an identity, you are that identity. If you lose a fight, you don’t feel that your character has died, you feel that you have died. There’s no level of indirection: you are there.” So, players can construct online personae which are very unlike their offline personality, they can create ones which are also very similar, and the construction of an online identity can have an effect on their real-life’ identity. ‘Drift’ is the term given to the phenomenon of players and characters changing to fit one another (Bartle 2001). When a player is more aligned with his character, he may also be more immersed in the character and the virtual world. The ideal is seen as being when one reaches full immersion and character alignment at the same time and pace. So, in a very demonstrative sense, we are the characters we play and they are us. The association may be stronger or lesser in some instances, but there is a connection. This past weekend I attended the wedding of my friends, Katie and Brandon. It was a lovely event and honestly one of the most genuine and romantic ceremonies I have attended. Both the bride and groom are pretty serious gamers, and as a little bit of fun, those of us known for our own geekery had the names of PCs we’ve played on the backs of our name cards. Going about our table, each of us revealed the character that they selected to identify us with. Now, I don’t think there was any actual psychoanalysis going on here – it was probably just the character that popped into their heads first – but I found myself pondering the implications. The character I received was, arguably, one of the few characters I’ve actually played in the past ten years (I usually run games). It was Santiago Roma, the megalomaniacal Vodacce villain determined to ascend to his rightful place as ruler of the world by lying, scheming, and strangling people in dark alleys. He was a sociopath, devoted to his own ambitions. Now, this was a 7th Sea campaign where everybody was ostensibly supposed to be villains and, accordingly, I made a pretty horrifying villain. Oddly, though, one of the things I remember best about that campaign was how heroic so many of my fellow players’ villains became. They were a tad selfish, yes, and often irresponsible or mean, but Roma was the only one who could be considered truly evil. What does that say about me? Now, I didn’t really identify with Roma as described by Curran above. If he had died, I might not have been all that upset – he had it coming. But I did work very hard to see to it that he didn’t die and that he did achieve his aims and that he wasn’t duped by the other players. I suppose that might say that I’m competitive, that I’m prideful, and that I can be aggressive when angered or threatened. All of these things, if I’m being honest, are true. They aren’t my favorite qualities about myself, but to say they are false would be dishonest and, very unlike Roma, I try to be honest to a fault. Sitting beside me at the table was my friend Serpico. Serpico’s character was Eoin “The Wind” Donovan – another 7th Sea character from a different campaign – who was the glory-seeking, ever-friendly, ever-flamboyant Glamour mage who earned himself the title ‘Los Bumblederos’ due to a famous duel, and wore a yellow and black striped tunic to match. Serpico has also played Finn Cadogan, a character that he used to drive up every week from New Jersey to Boston to play during a time where, according to him, he wasn’t very happy in his job. What can we say about Serpico, then? Did he identify with Finn Cadogan? Hell yes! I have never seen anybody so hopelessly terrified as when Finn had to face his old nemesis, Gallo. I have never seen anyone so elated as when Finn and Conrad Varner defeated the Kalsaari 8th Heavy Infantry at Atrisia. Serpico and DJ (Varner’s player) got up and danced around the room. In a very real sense, Finn is Serpico and Serpico is Finn. DJ is Varner and Varner is DJ. I’m not a psychologist, so I try to refrain from psychoanalyzing others (even though I do it constantly anyway). I’ll stick to talking about myself: The characters I have loved playing the most have all been scrappers. Old veterans and sly up-and-comers struggling tooth-and-nail for their piece of the prize. They might not be the prettiest or the nicest or even the best, but they will never give up and do whatever it takes. What does that make me? A fighter, I guess. A fighter in my own little personal battles, competitive, aggressive, and practical. Is that really me? I don’t know. It makes you think, though. Posted on October 9, 2013, in Gaming and tagged 7th Sea, International Journal of Role-playing, PCs, psychology, RPGs. Bookmark the permalink. 2 Comments. One — thank you for the kind words about the wedding! 🙂 And yes, Roma was just the first who came to mind; same with most of the characters we put on the cards, it was whoever came to mind first for that person. Two — glad to have partly inspired a blog post! w00t! Back to Roma, he really was the vilest of the villains. One thing I enjoyed about that campaign in the end was how our characters covered such a spectrum of evil, from Roma at one end and Bella at the other, meglomaniacal to anacharists to a little bit mad to self-righteous to misled. I actually did try to play her more selfish at first, but it changed fairly swiftly for a few reason–one, my previously stated default mode edged in, and two, I wanted to cover a different kind of villain than what everyone else was showcasing. Reblogged this on Alea Iacta Est.